As with all good things, my time in Dubai came to an end before I even knew it. I tried to cram much into that last night, including my visit to Barasti, but eventually that night I had to go back to my hotel to finish packing and then checking out. 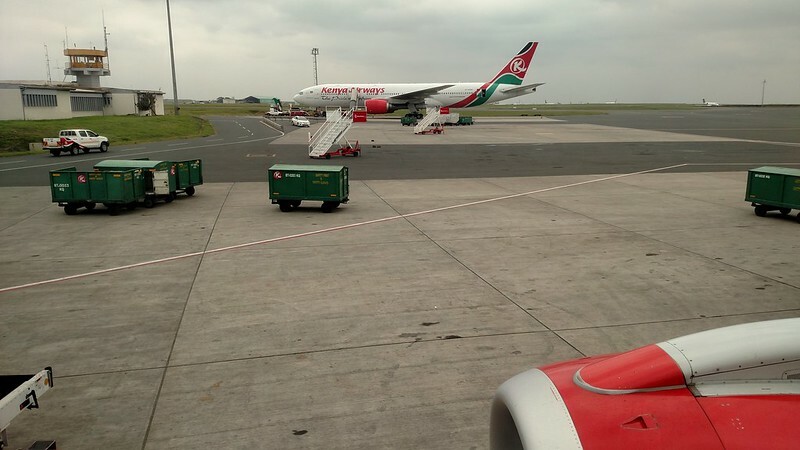 Much like my arrival into Dubai which was in the middle of the night, my departure would be the same – Kenya Airways turns around their aircraft here with minimal delay. That’s right, I would be flying Kenya Airways again, due to their excellent route network across Eastern Africa and of course being the only way for me to get to the Seychelles while being on a SkyTeam carrier. 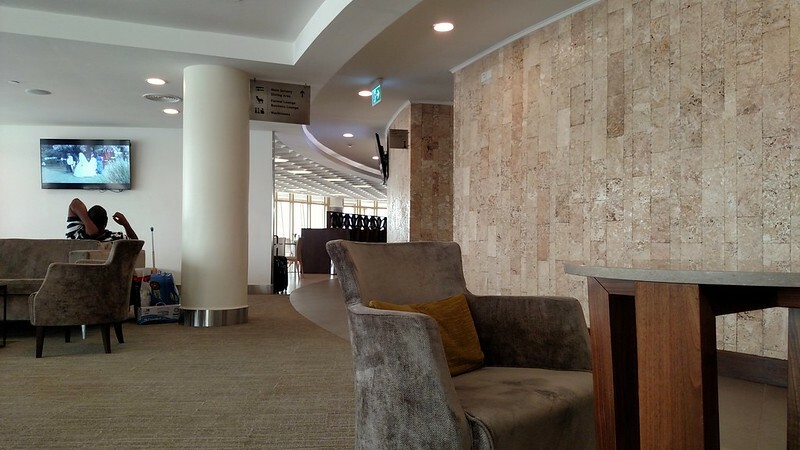 Really, my fate was kinda locked in because of my destinations, but these next two flights gave me even more opportunities to see what Kenya Airways was all about, and on this leg, get to try the other Kenya Airways lounge in Nairobi – the Pride Lounge. I made it to the airport in relatively no time with my driver dropping me off in front of the terminal. Perhaps I thought the terminal would be a bit more grand, but I have to admit it was not as modern as I thought it would be. I’m sure the portion Emirates is housed in is, but those of us flying the ‘lesser’ airlines, it wasn’t a terminal to right home about. Thankfully at the the least, I was able to get a luggage cart for my ridiculously heavy and awkward duffel; the one thing I had learned at this point on my trip was that backpack straps be damned, there’s just no good way to carry that bag. 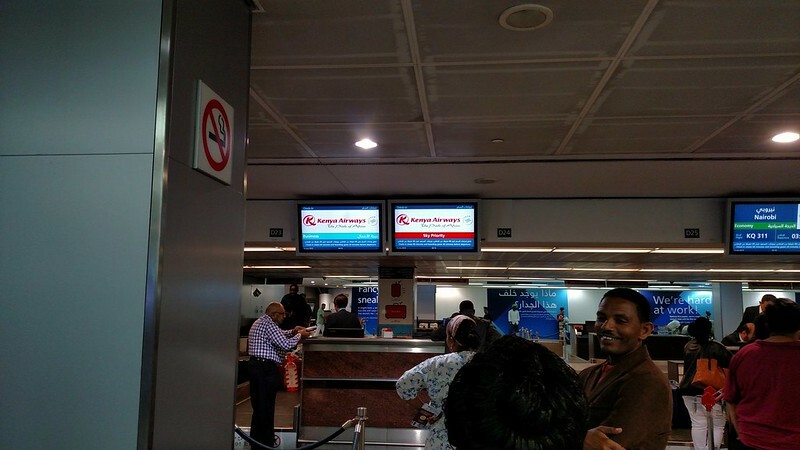 The Kenya Airways counter was easy enough to find, being at the end of one of the rows of check-in desks, and I made my way into the Sky Priority lane. None of the lanes were moving exceptionally quick, but I was here plenty early so there wasn’t much rush. 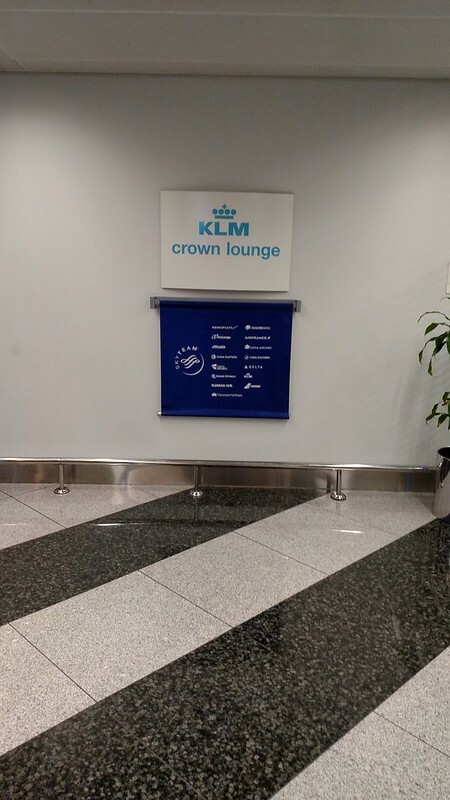 As it was my turn, I was dealt with quickly; bags tagged, boarding passes issued, and an invitation for the KLM Lounge. 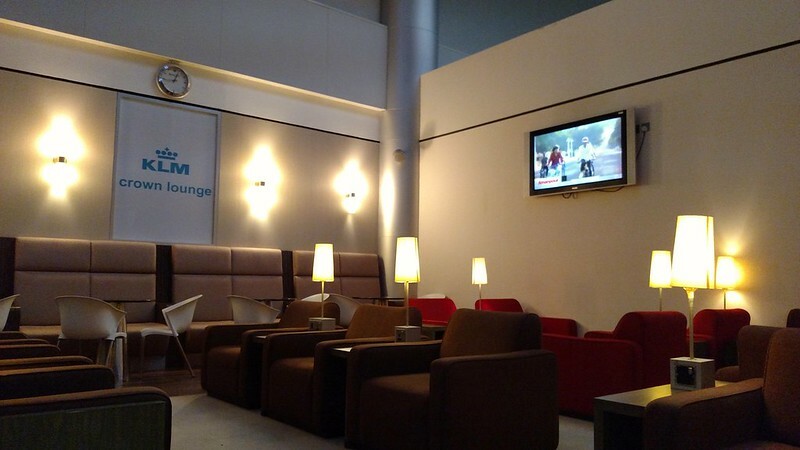 It was then through immigration and security which was quick and then I was on my way to the concourse and the lounge. 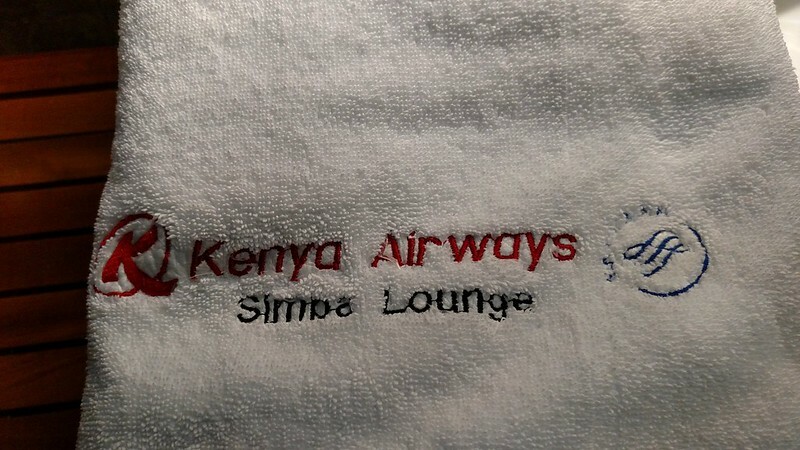 Since Kenya Airways had issued me an invitation to the KLM Lounge, I had decided to head there. One thing I always find interesting is when airlines in the same alliance will issue an invitation to business class and frequent flier members for the purposes of the lounge that is run by another airline in the same alliance when in reality, I should be able to get in with my boarding pass or elite status alone. 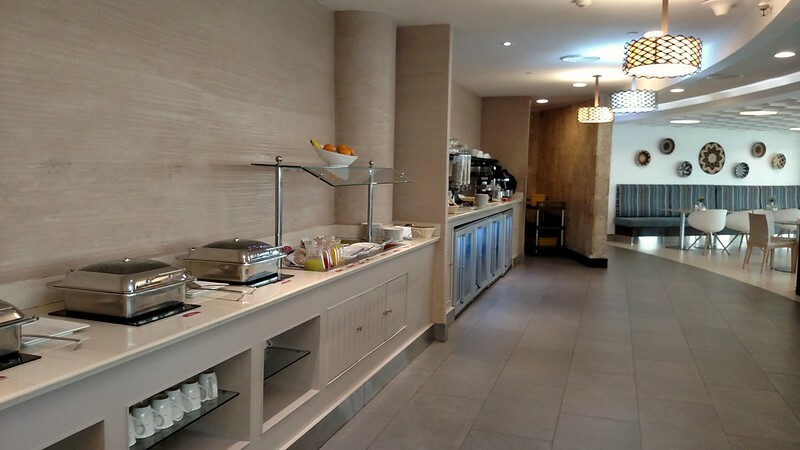 It was rather interesting back in 2014 where KLM had to issue me an invitation to visit the Delta Sky Club in Santiago when I was a Delta Platinum Medallion flying in KLM World Business Class back in 2014. Before entering the lounge though, I made sure to stop by the airport branch of Emirates Post – the post office of the UAE. I send postcards back to myself in the US during my visits overseas as it makes for an interesting and cheap souvenir. During my stay though in Dubai, I had almost forgot to do this very important task! Luckily, the Post Office was open and it was also a good way to get rid of a few dirhams left in my pocket. Upon entering the lounge, I was greeted by the one agent working, who took my invitation and welcomed me inside. The lounge, I must say was on the small side, and at this point in the evening I was the only one in here. Actually, I would be the only person in here for quite some time. 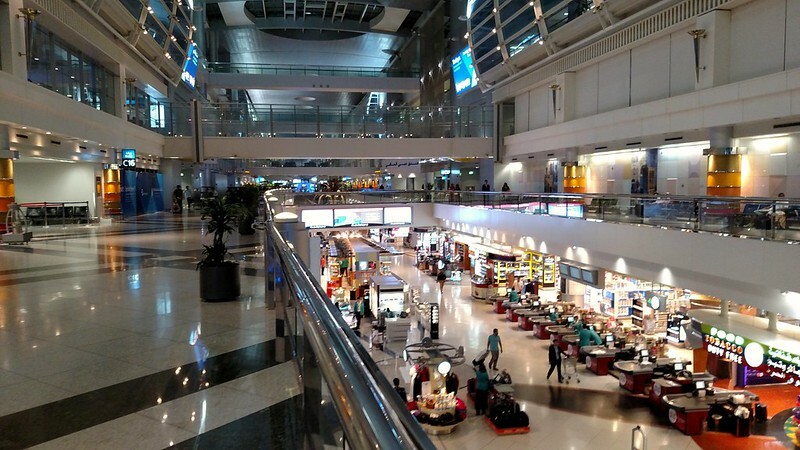 As it approached closer to my departure time, I decided to go and walk the terminal for a bit, check out the duty free, spend a few more dirhams in my pocket before I made my way to the gate. I didn’t really find anything of very much interest, and only wound up buying a bottle of water, so that I would have one for my flight south. Just as with the flight up to Dubai, what was supposed to be a flight on the brand new 787, turned out to really be a 777. And my seat wasn’t that much different either; I was in the same row as the inbound flight, but on the opposite aisle. That being said, there was no appreciable difference between the two flights in terms of comfort or in-flight entertainment. To be honest, on this sector, all I wanted to do was to do the impossible: sleep in economy class. I struggle with the sleeping while sitting up thing, but somehow I had managed to get a few hours of shuteye as we headed south. It probably wasn’t the best quality sleep, but it would let me keep on going! In fact, I think I even managed to sleep through the meal service! As with my other inbound flight to Nairobi we found ourselves parked at a remote stand and taking a bus from the plane to the terminal. 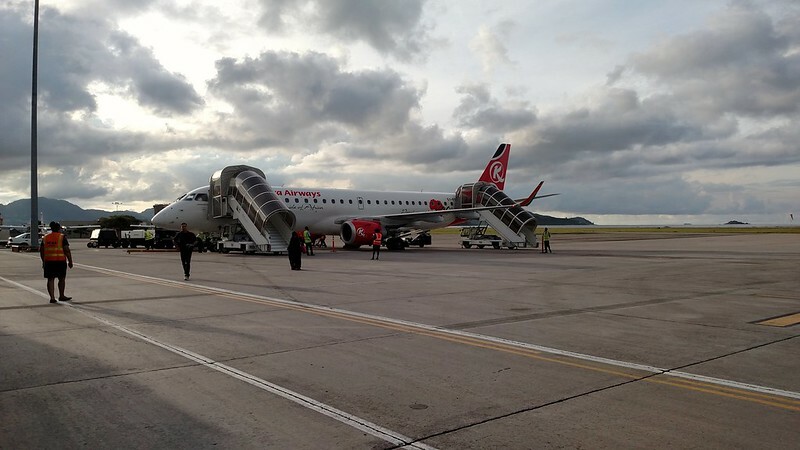 The process was pretty much identical – disembark via stairs, cram on to bus, get dropped off, clear through security (was just as much of a breeze as previously), and done. With nearly 5 hours between flights on this leg of my trip, I made my way to the Pride Lounge, since I had previously visited the Simba lounge. 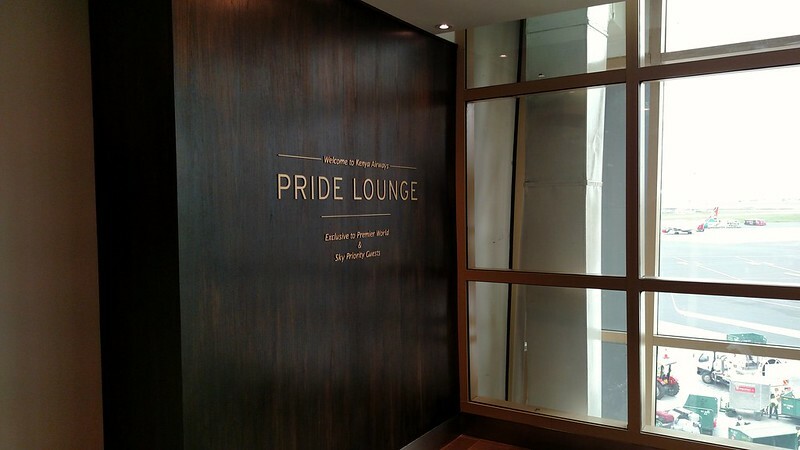 The Pride Lounge, as I understand it, is the newer of the two and is most definitely much larger, much brighter, and has more amenities. 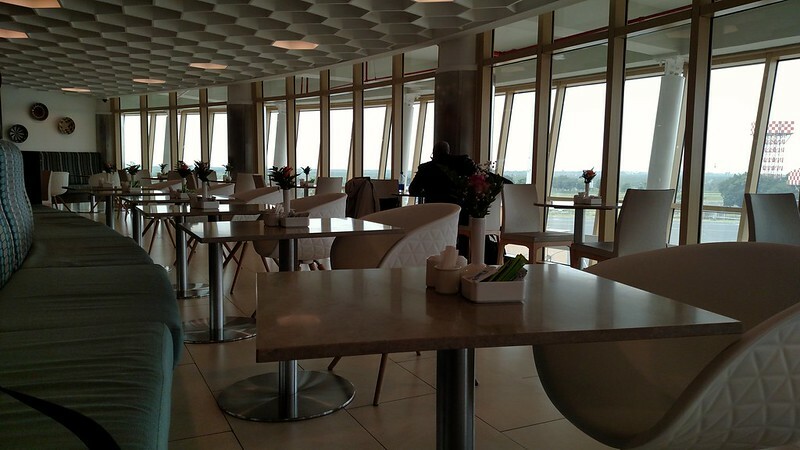 Much like the Simba lounge, it’s on the level above the main terminal, meaning a short elevator ride up. 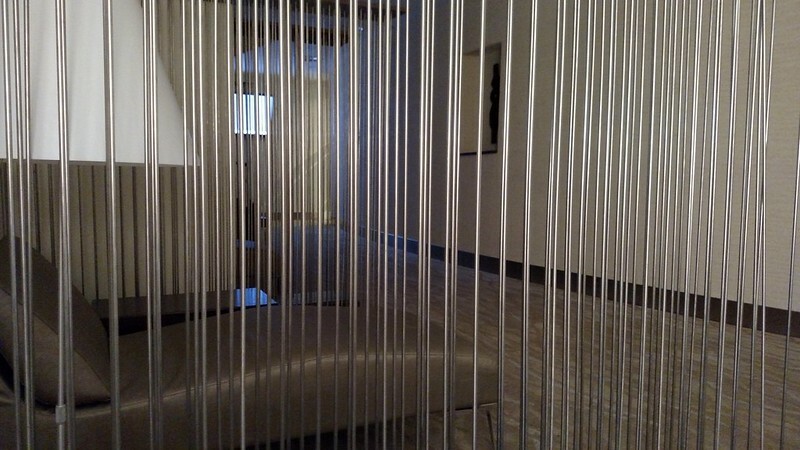 Upon entering the lounge, I was quickly checked in and informed of the details of my connecting flight. I then made my way down the corridor to the main lounge to start scoping things out. Kenya Airways did a fantastic job with breaking up the space and offering multiple different seating areas. With places to lounge, an area with tables and chairs for eating, a quiet/sleeping room and other spaces that were more secluded that would be good for working they really did well with the space. 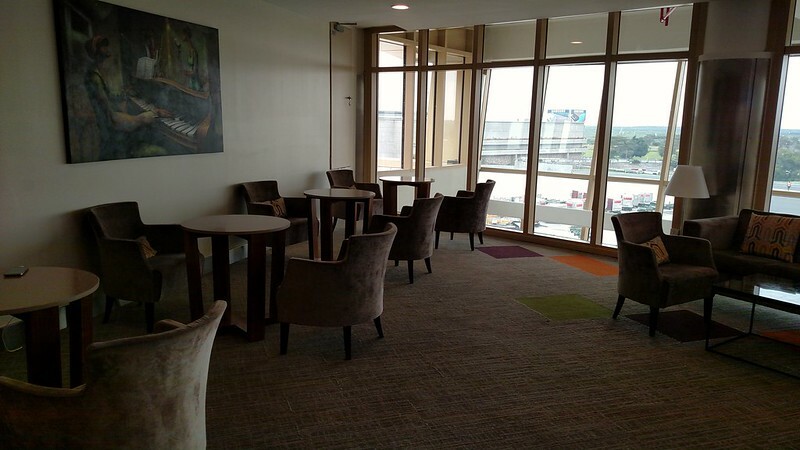 Add in the fact that there is a ton of natural light thanks to the large windows lining the one side of the lounge. First order of business was to get some breakfast! Kenya Airways had a pretty decent spread on display, offering both hot and cold options that surely everyone could find something to satisfy their hunger. 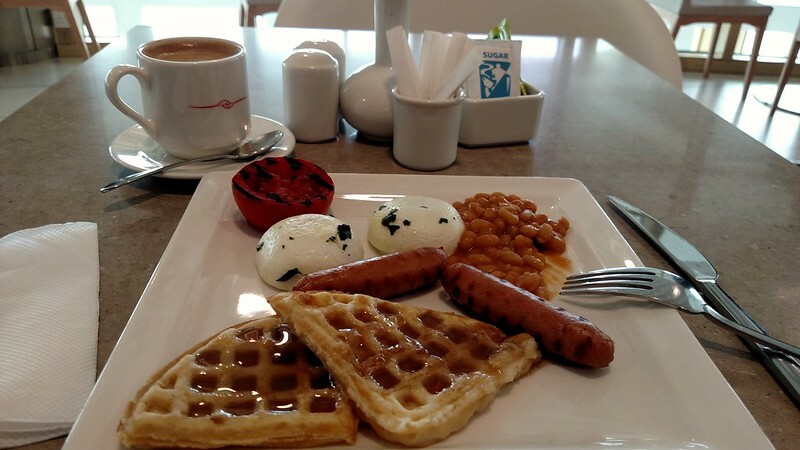 I will admit though that the waffles were a little bit of a miss, but everything else was fairly decent. I will say that they also did a great job of making sure that everything was well stocked as well. I don’t think I saw any food that was ever completely out. After I enjoyed my breakfast, it was time to move on to freshening up with a shower. Inquiring at the front desk, there did not seem to be a waiting list or otherwise for a shower. Basically, you have to catch the bathroom attendant and let him know that you’d like to take one; at least on the men’s side there were two shower rooms that were available. If one is available they’ll let you in, or in my case I was told to check back in 15 minutes or so. 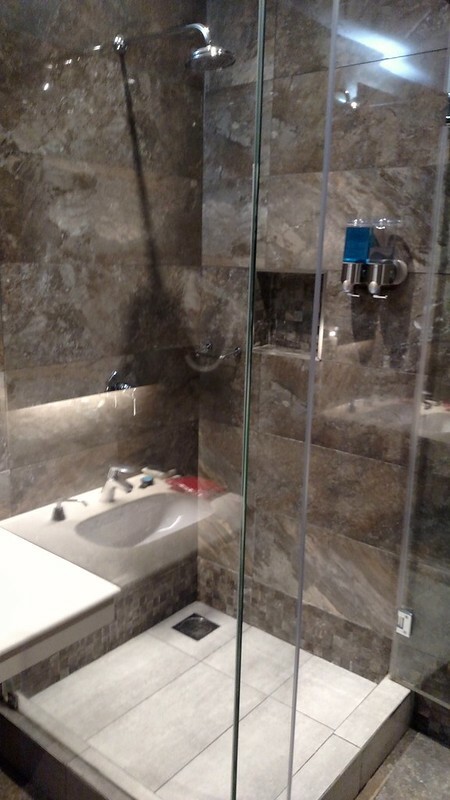 The shower room itself is large enough and they provide you with everything you need. The one thing that did seem interesting is that it appears that they provide what must be the Business Class amenity kit in the shower room. I can’t think why I would need the socks though! Water pressure was decent, the temperature of the water was nice and hot, and the towels were fluffy. I pretty much can’t complain! It always helps to get that shower on these long international travel days – nothing refreshes you better. 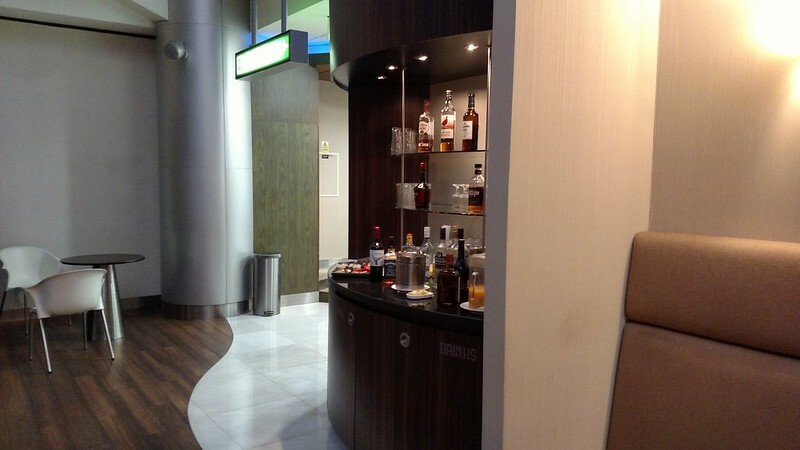 Soon enough, as always my extended stay at the Pride Lounge would end and it would be time to head towards the gate of my next flight. Having expected that the gate situation would be similar to my flight to Dubai, I decided to leave the lounge a bit later. Upon making my way to the lower level gates, I found that most of the gates weren’t actually miniature holding pens. Of course, since I left close to what was identified as the boarding time, I wasn’t going to spend much time there anyways. Apparently, Row 12 and I are the best of friends when it comes to Kenya Airways, as on this leg I found myself in seat 12J; which is also an odd number/letter to see on an aircraft that size! I’m assuming that Kenya Airways has standardized seat numbers across all their aircraft, which is pretty smart. 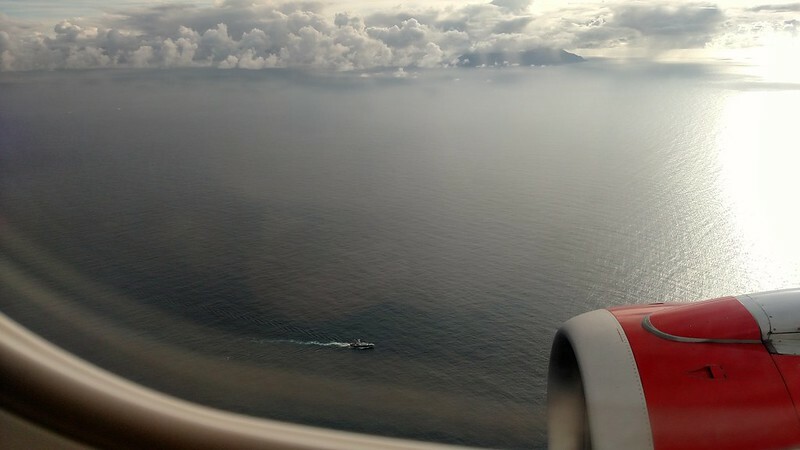 In this case, I had a window seat, as I had wanted to be able to take in Mahe Island as we approached, although for most of the three hour flight there isn’t anything to look at except the Indian Ocean. With the light load on the flight, I was able to spread out a bit. 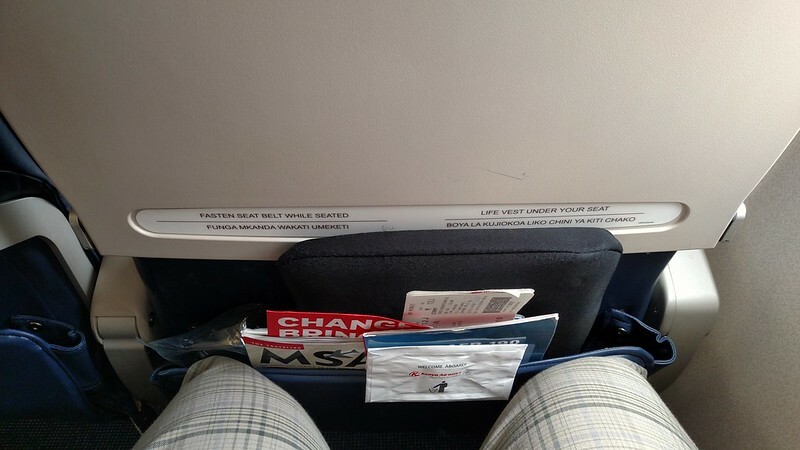 Seat comfort was generally decent and legroom was about what you would expect as well. Not tons of it and not digging that deep into my knees. It wasn’t long after take off that we were out over the Indian Ocean and above scattered clouds. 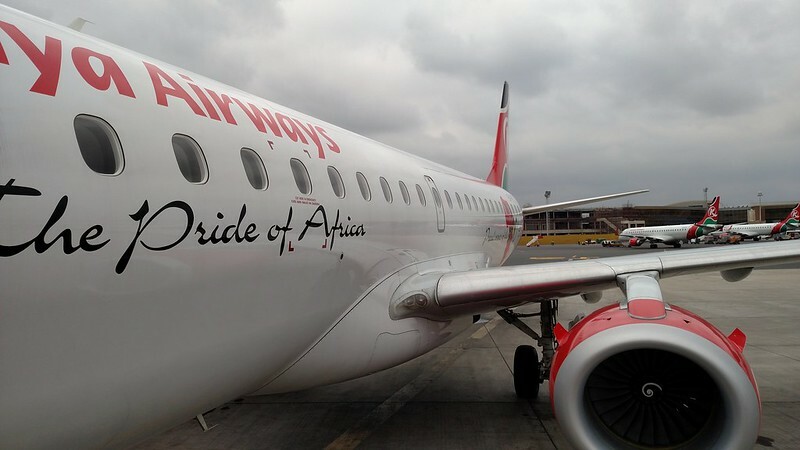 From about this point, the flight attendants came through and started the service, which was done in the same order as on my Johannesburg to Nairobi leg several days prior. 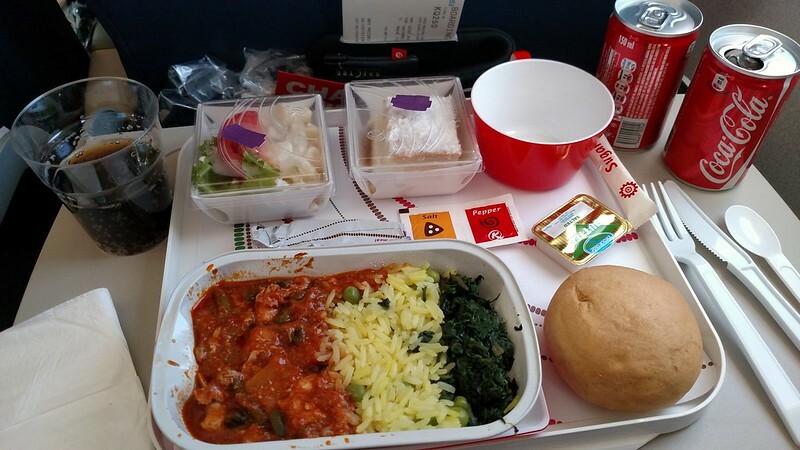 The lunch was about as good as mystery meat can be – I believe they said that it was lamb, but you never really can tell with a lot of in-flight meals. Even being the mystery that it was, it actually wasn’t terrible and the cake for the desert was actually moist. In short, it was a heck of a lot better than the fish I had on my flight from Johannesburg. In-flight service was pretty decent throughout the flight with the flight attendants passing through the cabin a few times throughout. 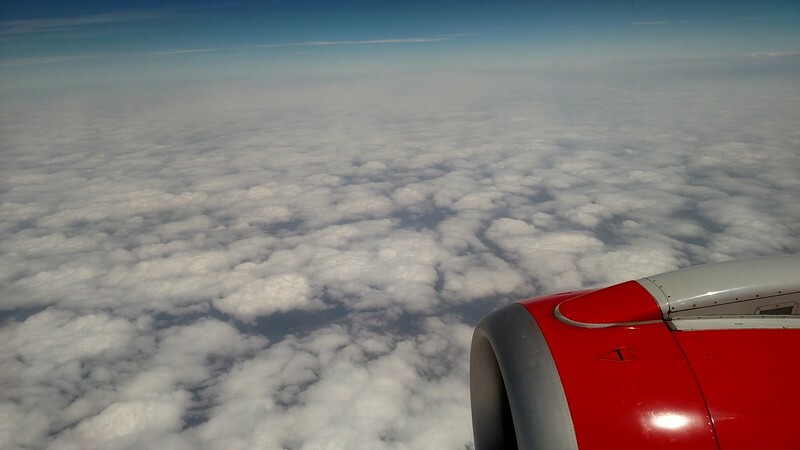 In the last several minutes of the flight, there started to be signs of life below. First boats and then followed up by the islands! 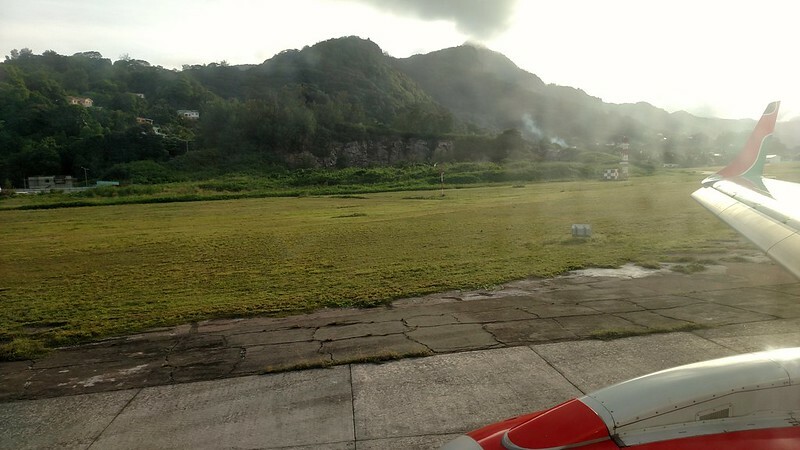 The flight made a fantastic approach into Mahe, and I had correctly picked the best side of the aircraft as we came around the North side of the island and then entered the pattern into the airport on the East side of the island. I got a fantastic view of it all from above! Once on the ground, I disembarked and made my way across the ramp towards immigration. Because I was on a flight from Kenya, they wanted to see proof of being vaccinated against Yellow Fever before I could proceed to immigration. While I technically didn’t need it as a result of having been a transit only passenger, I’m sure if I had not been vaccinated and didn’t posses a yellow card, it would have made things more interesting for me. Thankfully having that card meant quickly getting through the health inspection and to one of the immigration officers. 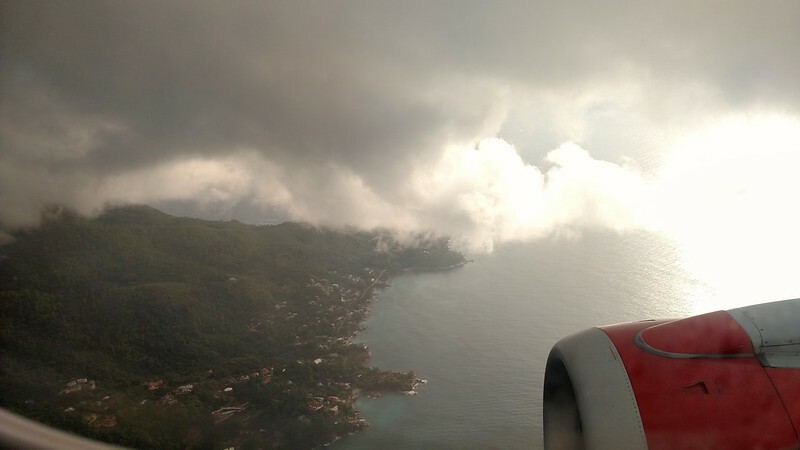 On The Ground In The Seychelles! The good thing about the Seychelles is that nearly everyone can enter without a visa for short term stays. What this does mean however is that the immigration officers go into probably more detail than you’ll find in most countries. 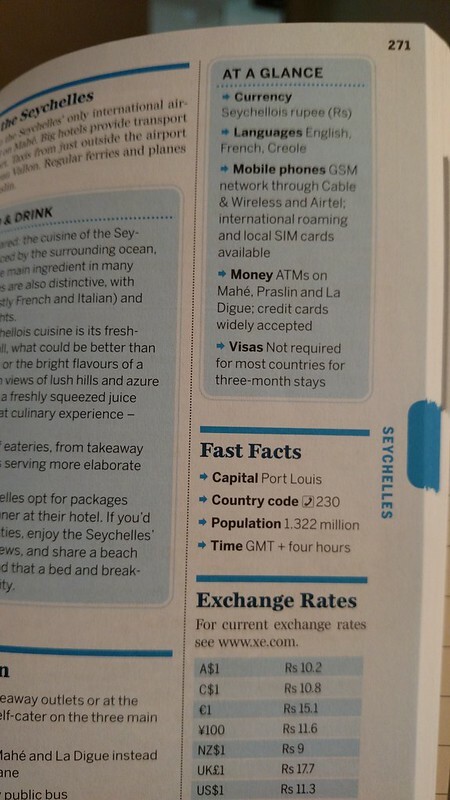 Make sure you have a copy of your itinerary and proof of when you are leaving, as when your passport is stamped (with their unique stamp, I’ll say), it will be annotated as valid only through your departure date and not a generic 30/60/90 days, as with so many countries. That being said, it really was relatively painless, and customs was a breeze as well. 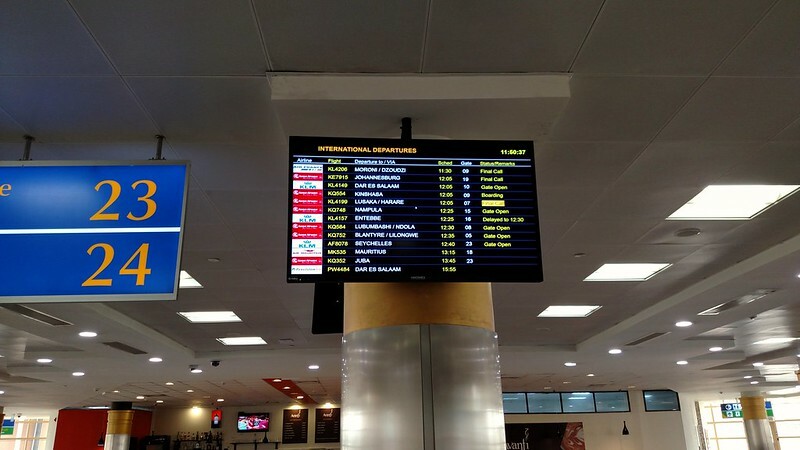 After a quick stop at the ATM in the open air arrivals and departures hall, I found my way to the taxi stand to make my way to my residence for the duration of my stay – the Hilton Seychelles Northolme Resort & Spa. 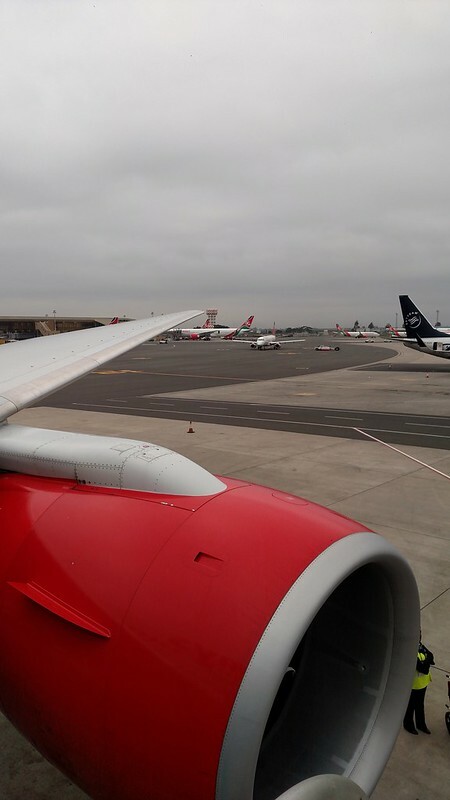 This entry was posted in Africa, Dubai, Kenya Airways, RTW, Seychelles, SkyTeam, Travel, Trip Report. Bookmark the permalink. Follow any comments here with the RSS feed for this post. Post a comment or leave a trackback: Trackback URL.